When things go wrong for Roger, he gets crabby. One day, while sitting in the naughty chair, Roger reflects on being called “crabby pants” and thinks that he can change things by simply fixing the pants themselves. With such a perfect plan, whatever could go wrong? 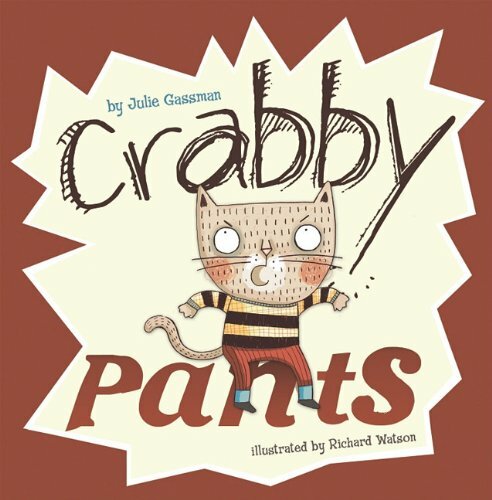 This books will be a hit with preschoolers that have been crabby — which is to say all of them — and parents who suffered through a “crabby pants” of their own — which is say all of them. The clear and lively illustrations make it great for storytime, and the story offers a perfect beginning to talk about better solutions for moody behavior. The Cow Loves Cookies, which can be given with this Cookie Counting toy or look for 105 more ways to give a book. Extra/Alternate Books: Grumpy Cat, by Britta Techentrup, or Cats, Cats, Cats, by Leslea Newman, or your own favorite cow, chick, or cat book. I don't know this one, I'll have to look for it. Another great story time! Thanks. I really enjoyed Karma Wilson's THE COW LOVES COOKIES. And of course, CLICK CLACK MOO. Aw, Sarah had what I was thinking of: Click, Clack, Moo! I'll stick with the bovine theme, though and go with Mr. Brown Can Moo, Can You? Dr. Seuss never fails. The letter "c" is the best letter ever, even though there are concomitant cows and chickens.